Bass Weejuns - In 1936, G.H. Bass & Co. put a stylish spin on a Norwegian farm shoe designed for loafing in the field, and playfully dubbed them Weejuns introducing the world's first penny loafer. 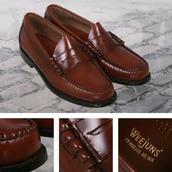 From strolling across college campuses to doing the moonwalk, Weejuns have been found on industrious feet ever since. 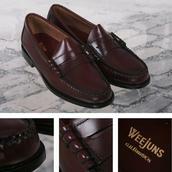 The Iconic Weejuns continue to be in demand by casual and fashion-forward crowds alike.